Getting a drive in Formula One is becoming harder by the year. In 1993, it's probably been tougher than ever. The recession hasn't just caught up with those teams fighting to keep up with the ever-spiralling cost of taking part, it's already overtaken several: in the recent past, we've lost AGS, March, Fondmetal, Modena-Lamborghini and Brabham. Combine this with the increased longevity of modem F1 drivers' careers, and the result is fewer and fewer cars spread between an ever-increasing number of aspirants. It has become clear that Formula One, at its entry level, is no longer governed by a system of meritocracy. Access to the kind of budget that will keep a struggling team afloat is a more vital component in one's CV than a string of championship victories in F3 or F3000. The list of worthy drivers sitting on the sidelines would make a competitive Grand Prix field in itself: Gabriele Tarquini, Emanuele Naspetti, Roberto Moreno, Mauricio Gugelmin, Eric Bernard, Gianni Morbidelli, Andrea Montermini, Nicola Larini, Bertrand Gachot, Eric van de Poele, Bernd Schneider, Allan McNish, Fabrizio Barbazza, Marco Apicella . . . all have proved that they've got what it takes to compete in top-level single-seater racing. You can add the likes of Mika Hakkinen, gainfully 'unemployed' as McLaren's test driver since Ayrton Senna decided against taking a sabbatical, and recent F1 reject, the enigmatic Ivan Capelli, to the list, not to mention the fact that at least a dozen of the drivers contesting this year's European F3000 Championship, widely recognised as the final stepping-stone in the career of an aspiring Grand Prix driver, have serious F1 potential. And you can bet that there won't be any more than a fistful of F1 drives available come November. We recently discussed the situation facing drivers trapped in that awkward, deep gulley which now exists between F3000 and Formula One with a man to whom it is all too familiar: Jean-Marc Gounon. French F3 champion in 1989, Gounon spent three seasons in F3000, By the time he crossed the line to win the final round of the 1992 championship, he had earned himself a solid reputation as one of the best up-and-coming racers in the business. Age might not have been on his side he turned 30 on January 1 this year but Formula 3000 team managers were queuing up to see if he'd be interested in staying for a fourth season. He wasn't. After setting some impressive test times first time out in a F1 car, he was one of those considered for the second Larrousse seat, alongside Erik Comas, but Philippe Alliot got the nod. 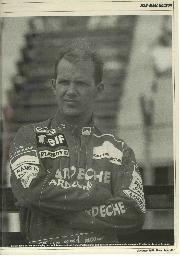 Jean-Marc was subsequently nominated as one of March's two drivers for the year, but that was a false dawn. He turned up at Kyalami and Interlagos but the financially straitened team's cars didn't, and its F1 entries were subsequently withdrawn. The fact that so many leading F3000 teams tried to woo the Frenchman last winter proved that the latest teenage Brazilian hotshot is no longer necessarily a credibility ticket. 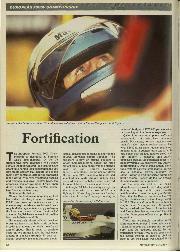 Gounon never had any intention, however, of spending more time in F1's ante-chamber. "It would have served no purpose," he says. "If I'd won races, it would have been expected of me. People would have said 'So what?' If I hadn't won, 'I'd have been regarded as a failure. It would have been a no-win situation. 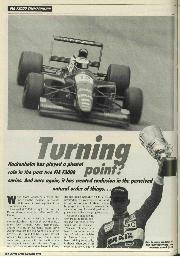 I think I've proved my point in F3000, winning races in cars that were regarded as difficult. I couldn't have gained any benefit by doing another season." His reputation has been founded on unfailing spirit. 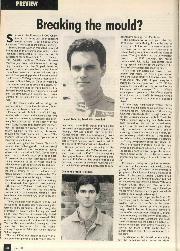 He had a patchy start to his F3000 career, but by the end of 1990 his Madgwick Reynard was a regular front-runner. It was a good foundation on which to build for the following season, but 3001's Ralt RT23 was not a smash hit. It was either bang on the pace, for example at Pau, where Gounon scored the only win of the year for anything other than a Reynard, or it was struggling to qualify. 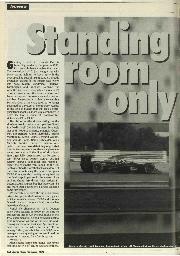 Jean-Marc never stopped trying, however, and his lightning starts became part of F3000 legend. At Enna, where he won on the road, he was deprived of victory after an over-zealous official adjudged that he had jumped the start, despite televised evidence to the contrary. He almost joined Team Crypton in 1992, and it would have been fascinating to see how he might have got on with the eventual champions. His performances in the slightly less competitive DAMS Lola suggested that he'd have given eventual champion Luca Badoer a tough time, had he enjoyed parity of equipment. All the same, Gounon proved a thorn in Reynard's side once again, preventing a clean sweep for the second year in succession with his beautifully judged success at Magny-Cours. At one point, the leading five cars were covered by just 1.5 seconds, but the Frenchman's concentration never once wavered. It wasn't so much that which made him a sought-after asset, however, as the manner of his performance throughout a season in which the Lolas were clearly struggling to keep up. At Silverstone, Gounon was in the middle of a first-corner pile-up from which he emerged, intact, in 19th place. One hour later, he was fourth, having made up ground the hard way, forcing his way through the field with an expert blend of control and aggression. 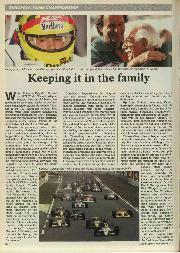 Such qualities were evident throughout the year, and his reputation was further enhanced in December, when, during his aforementioned F1 baptism, he lapped close to Erik Comas' pace in a Larrousse-Lamborghini at Paul Ricard. But there was to be no regular GP seat, even though Gounon, a long-time Marlboro driver, has benefited from governmental support in the wake of the ban on tobacco sponsorship in France. His is a paradoxical situation. Unlike many, he has money for a seat, it's just that there are none left. So how does he spend his time? "At the moment, I'm chasing as hard as I can to get a drive. I've got the superlicence, and I've got enough money for the latter part of the year if a drive becomes available. I don't know where yet; could anybody have predicted earlier in the season, for instance, that Capelli was going to be dropped so soon? These things occur quite suddenly, and in F1 it's hard to guess what might happen next. At least I'm in a position where I can compete for any drive which does become available." On top of that, of course, there is always the possibility of a testing contract, and Jean-Marc has maintained contact with Larrousse. "I owe Gerard a great deal of thanks for letting me test his car last winter, because I was able to prove that I'm capable of driving an F1 car both to myself and to F1 team managers. It's gratifying to me to know that I can do it. During the summer, with races following on so quickly one after the other, it's hard for Larrousse to fit in a test programme. and for me to sit down and sort out a deal with them." He has, however, been able to complete further test work, assisting Comas with the sequential gearbox development programme prior to the Canadian GP. "All of this helps, of course. It means I have greater experience, and more technical knowledge than I had at the end of last season." After five years of racing competitively in F3 and F3000, how does it now feel to go to races in civvies? "From the point of view of morale. I've never been dispirited. With fewer and fewer F1 drives available, and more and more drivers chasing them, you've got to be realistic. You have to keep your feet firmly on the ground. For me, it's nice to know that I have the funds available to challenge for a seat if an opportunity presents itself. In the meantime, I've got to keep myself in trim. The best way of keeping fit during the season is to race; as I'm not doing that at the moment, I'm having to train harder than ever to keep myself in peak condition. It's nice that Lola has asked me to help with development of its latest F3000 car. For me, that's been valuable from several points of view, technically and physically." Indeed, despite his understandable reluctance to compete yet again for the European F3000 title, it is likely that he will race a works Lola in the final few rounds of the series, as the Huntingdon marque seeks to regain customer confidence after what has, in Europe, been a barren season. That apart, his only other offers of employment have been from Porsche, which has invited him to drive a guest car in the French Carrera Cup. That, however, would be purely a means of amusement. He is in no hurry to follow the likes of Schneider, Joachim Winkelhock or Emanuele Pirro into an alternative career, no matter how well salaried. "I don't want to diversify too much. I'm concentrating 100 per cent on trying to get an F1 drive. That's a full-time job. If I went off to do touring cars, for instance, people would soon forget my F3000 record, and stop thinking about me as an F3000 driver who wants to move up. At this stage of my career, I can't afford that. I want to race in F1, and don't want people to start having any other ideas about me." When Ivan Capelli split from Jordan, there were rumours that it could pave the way for an unproven F1 aspirant, such as Gounon or David Coulthard, but instead the drive went to Thierry Boutsen, a 35 year-old with 152 GPs under his belt and just one top six finish to his name in the past two seasons. Since joining the team, the Belgian has consistently failed to match the pace of his younger team-mate, Rubens Barrichello. That, surely, must be frustrating to see for a hungry, under-employed racer who is left to ruminate on what might have been? Gounon is completely devoid of bitterness or envy. He's disappointed, of course but, ever the natural analyst, he is as lucid and rational out of a racing car as he is awesomely competitive in it. 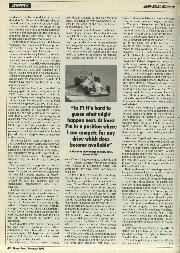 "You have to accept that some drivers are better suited to particular sponsors' requirements than others. It's a fact of life, and I guess that's what happened with Jordan. It's perfectly understandable. For me, it's just encouraging to see how quickly newcomers such as Schumacher, Wendlinger and Barrichello have adapted to F1. I find their progress heartening. 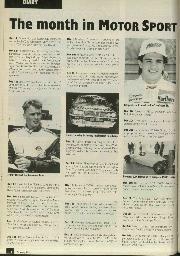 The test with Larrousse gave me plenty of confidence. I'm just waiting for my turn to prove myself to a wider audience.